This piece is a little broader in scope that our past posts about China. That seems useful, since war-mongering in press coverage of China has put us all in blinders. We’re not claiming here that the Chinese are angels, but there is a lot more to the story that needs to be discussed. China is now the world’s biggest economy and is continuing to grow rapidly. Further its population is more than four times the US. That has many consequences worth thinking about. China has built itself up from nothing to a world class challenger in many areas. This is not just—or even primarily—a case of “stealing from us”. It is imperative that we understand their example and what we can learn from it. On the first point, it should be noted to begin with that while the Chinese economy is the biggest in the world, the country is so big that its per capita income is well-below Mexico. A rising standard of living in China could drive growth in the rest of the world for quite some time. That is a dramatic turnaround in what China means to the rest of the world. It is also the reason why virtually everyone expects China’s trade relations to be renegotiated. Opening China has moved from a largely theoretical matter (because there just wasn’t that much to be sold) to become the primary issue. This is the time for negotiation, but it’s also a window of opportunity we can easily miss. In this, as we’ve noted before, a unilateral trade war is actually counter-productive. We’re defending protectionism, when the primary issue is open access to the Chinese market! Further by insisting on a bilateral deal, we’re substantially reducing the leverage needed to make the deal a success. The Business Roundtable of corporate CEO’s said as much prior to the start of current negotiations. This isn’t about trade deficits; it’s about worldwide rules of fair trade going forward. Trade negotiation, however, is not the only issue here. US businesses have long had the luxury of focusing on the domestic market. Economies of scale will now demand a less parochial view. An obvious example is loosening of fuel economy standards. That’s a concession to our automobile industry for the domestic market that will hurt international competitiveness. Another example is 5G mobile equipment. US vendors are behind the curve, because the domestic market has been fractured and slow-moving. – Government-sponsored R&D pays big benefits. That is the single biggest contributor to the Chinese success. They have created a world-class technological empire out of almost nothing. Even the much-lamented Chinese technology theft is a non-trivial (if nefarious) accomplishment. How many companies do a good job managing transitions of responsibility even for their own software? We used to care about the government role in research too. It was assumed in the good old days of the 50’s and 60’s. Now we have not only cut back on government R&D (Trump’s latest budget is a recent example), but with the current anti-science nostalgia we’re not even sure we want much to do with scientific progress. – Education is an imperative. It’s people who make for national success and we need them to be prepared for the jobs that will defend our national standard of living. China has been ready to spend the money to make it happen. – We should want to drive up the value chain. Despite past history, the Chinese understand perfectly that price-competitive businesses are not the way to go. Real wealth comes from dominant industries with the power to sell on content instead of price. That’s what technology can deliver. It’s simply not in the cards to believe past successes will just revive. – All businesses need to embrace technology for success. Even in the cost-sensitive outsourcing business, ease of interworking was an important factor in Chinese success. We should never underestimate the value of the dynamism of the US economy. But we had better be careful to understand what has really worked for us. There has always been an important government role, and diversity mattered too. In the Chinese example, success was only possible because government provided the environment, particularly education and infrastructure, for the businesses to grow. In general, prosperity requires both the environment and the opportunity to achieve success. We are misled if we think “enemy” is all we need to know. China is an important factor for both good and bad in the world economy. They were an important help in the efforts that prevented a depression in 2008. They can be a major locomotive in the world economy going forward. They contribute to the worldwide development of science and technology—which makes us all richer. They recognize the importance of climate change. It is our task to make that all work for us. To get there we need to treat the Chinese like any other adversary—we should deal with them from strength and look for mutual advantages. It is not productive simply to dictate, with the idea that we can shut them down by denying them access to our market. We represent 18% of their export market and much less of their total economy. That’s plenty to cause trouble, but not enough to dictate, and in any case real pain would hurt us as well. Further, if we want success in their market, there has to be ongoing mutual self-interest—no signed document will do it. And there’s a historical side of this as well: China endured some of the worst of western imperialism in the nineteenth and early twentieth centuries. That memory lingers, and we are not served by recalling it with our behavior. Mutual advantage is much better than antagonistic isolation. We need to extend the rules for fairness in international commerce through the WTO. As noted earlier all parties recognize this has to happen, and we have historically led such initiatives. We have twice the leverage in cooperating with the EU (also 18% of Chinese exports), and we avoid the hypocrisy of endorsing protectionism in the argument for opening of their markets. Matters such as intellectual property protection and theft should be solvable problems, in part because the Chinese now have much to defend as well. It’s not for nothing that Huawei is well ahead of the curve in 5G development. Chinese universities are now high on the list of international institutions (even though Western ones still have cachet in China! ), and the Chinese are acquiring patents like everyone else. It’s also true, if seldom noted, that Chinese computer hacking decreased significantly by the end of the Obama years and went way up when Trump declared economic war. The military installations in the South China Sea are a serious problem, but the fact is that the great majority of Chinese imports and exports pass that way—so it’s not surprising they’re worried about it. We make that worry all the greater by declaring that it is legitimate to use all resources at our disposal to get the Chinese to do what we want. The only real solution is some kind of freedom of the seas regional agreement that all parties can have confidence in. Human rights violations are also important, and we have to keep those issues alive. It’s hard to know how far we’ll be able to get. The one thing you can say is that we shouldn’t be too quick to use Xi a stand-in for China as a whole. We’ve already noted Xi is a throw-back (a “princeling” heir to the Maoist past), so perhaps there is hope for better later. There are many conclusions to be drawn about us if you take Trump as a stand-in for everything American. In the end the point is to treat China like any other independent nation. China as “enemy” has real roots, but also large doses of domestic politics (China has been a convenient excuse for our own misdeeds) and “yellow peril” racism. China needs to work properly in the international system of trade and ideally also in international security agreements. Any efforts to avoid a new set of arms races will have to involve them. Vigilance is fine, but there is at least the potential of much to build on. The title of this article sounds rather ordinary, but in fact there’s more to say than you might expect. There aren’t a lot of new facts here, but we bring together several strands of argument that don’t tend to be followed to conclusion. It’s useful to think step-by-step about prosperity today and going forward. Our national standing today is largely determined by technology. It is only because we are on top of that heap that we have the money that supports the rest of the economy. That includes much of small business and service industries. It is from the strength of our competitive economic position that we can pay for the non-competitive industries we choose to support. The aluminum and steel tariffs are being paid by us from the industries that don’t need them. To state this somewhat differently—we are not going to build a dominant economy by selling each other stuff anyone can make at artificially high prices. It’s also worth pointing out, given all the discussions of the military budget, that the technology argument applies in spades for the military. Building new aircraft carriers is not going to make us safe. One only has to think, theoretically of course, about the effect of a North Korean virus disabling the military’s command and control. 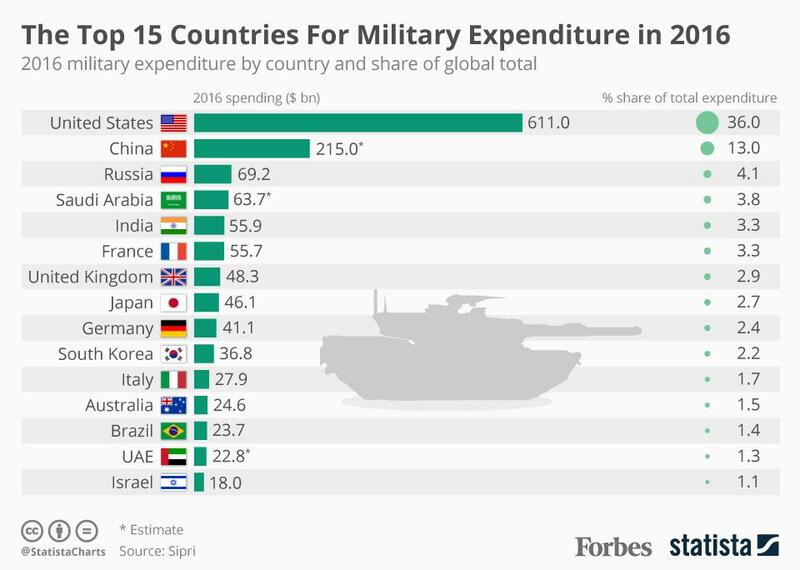 From the chart below, it is obvious that our level of military spending ought to quash everyone else hands down if money were the only object. But it’s not doing the job, because that’s not the game anymore. And it’s not just AI, it’s across the board. What all this means is that the people who support our technology position are critical resources who matter to all of us. This is a lot less elitist than it sounds, because it’s not saying we shouldn’t care about or value everyone else (more on that later). The point is that we shouldn’t be spending our time worrying about who is or isn’t supplanting whom. Our success depends on nurturing and exploiting the best and the brightest—at least for these skills—and we had better spend our time trying to find them and encourage them, regardless of race, gender, or sexual orientation. And if foreigners choose to come here and establish successful startup companies—mostly in high tech—we should be happy they do. It is a major strength of the US economy that people find the US to be the best place to realize their ambitions. We erode that strength at our peril. Anger at elite technologists may be natural, but they are the wrong targets. Their effect on the rest of us is positive. What we need to avoid is a two-tiered society of haves and have-nots. Businesses today are different from the past in important ways. Since we’ve identified the key role played by the tech sector, it’s worth thinking about what kind of businesses those are. So let’s take a quick look at Google, Apple, Amazon, Microsoft, and Facebook. – A first point to notice is that they are all some form of monopoly. This is not surprising as they are all (even Amazon and Apple) essentially software companies. Software businesses invite monopoly, because costs of production are minimal. In such cases, research and development costs become primary, and the company with largest market share can afford to offer products with more features than a smaller competitor can. As automation continues, particularly with AI, similar arguments will apply to much of the rest of the economy. Monopolies squelch competition. It is imperative for our success that established companies can’t limit the innovative power of new entrants. That has been our historical advantage over foreign competitors and is a major factor in any discussion of how we deal with the rise of China. This is not just a problem with Google, etc. The demise of Net Neutrality is a classic case of giving in to established players, in this case the major telecom carriers. Monopolies take more than their share of our money. Monopoly power limits price sensitivity. Since the determining feature of competition is more often uniqueness more than price point, products are priced at what the market will bear—as with the iPhone or patented drugs. Furthermore, through manipulation of assets including intellectual property, hi-tech monopolies have been tough to tax. Apple’s success in this is legendary. Their windfall from the recent corporate tax cuts is something to behold (and unnecessary as a spur to investment). It is imperative we learn how to tax monopoly-level profits. – Next, personal success in these companies requires a high-level of technical competence. Amazon is obviously a case in point, with two completely different populations: the mass of box fillers versus the corporate staff. Note that technical competence is not just a matter for developers, but is also required for the many people in management, support, administration, and even sales. As just noted, as automation proceeds, this trend will extend well outside of high-tech. This represents the threat of a two-tiered society, as discussed earlier. As a country this implies at the very least a basic responsibility for broad-based solid education and a livable minimum wage. It should be emphasized that strengthening of education is required for both national success and personal prosperity. Regardless of what advantages we have for staying on top of the heap, we cannot succeed if we don’t have the people to do it. – Third, all of these business are intrinsically international. With the growth of the world economy (and China in particular) economies of scale are such that we have to think in global terms. – Finally our fourth and last comment for this section is about a different trend not limited to high-tech—the institutionalized irresponsibility of business. It has become gospel that businesses have responsibility only to their investors, and all other considerations are more or less theft. Businesses used to care about retirement, healthcare, training, even local charity. But current reality is that if someone is going to care about those things, it’s out of the question for it to be them. In addition, because of the sheer size of the country, the US more than anywhere else has to deal with the phenomenon of towns or regions where the economic base can just disappear. Company town are the obvious example. In an age of accelerating technology change, we can’t stop such things from happening. And we can’t expect rescue to happen by all by itself. However we emphasize this isn’t just about charity. In the current state of affairs, the private sector is not be doing what’s necessary even to provide the environment for its own success. That leads to the next topic—what do we need for national success? Our infrastructure problems mean more than we thought. Infrastructure has to be thought of as whatever is necessary for national success and personal welfare. I.e. much more than roads and bridges. The educational system fits in this category as it is required for both personal and national success. Declining upward mobility and the student loan crisis are two indications that there is unquestionably a lot that needs to be done. Support for theoretical research is in the same category. It is precursor work for new technologies before they are ready for business. A point worth stressing it that it is not only the research itself that is important—research work assures that there will be a population ready to exploit new opportunities as they arise. Continuing on, we list a few more significant infrastructure projects needing immediate attention. – The American Society of Civil Engineers keeps a web site with a break down of national infrastructure requirements. We currently rate a D+. – To that we add the urgent needs of combatting climate change, which will be considerable, regardless of how the final plans work out. – Healthcare is currently in flux with ACA under attack and nothing to replace it. – Finally we have the general specter of a two-tiered society, with all the misery and threat of conflict that represents. That too needs to be dealt with as a national problem, and there’s no one in this picture other than government to do it. From the point of view here our much-discussed infrastructure needs—back to the roads and bridges—have to be viewed as bellwethers. The fact that we can’t deal even with roads and bridges means that we have a fundamental problem funding the common good, and we have to take that head on. There is a mismatch between the needs of our country and the forces that currently control it. The governing ideology of this country is simple to summarize: let the private sector do it and get out of the way. All government regulation is bad, and taxes are just a brake on the private sector’s ability to make everything great. The chief beneficiaries of this policy are the ultra-rich funders of the Republican Party, although the problem of money in politics (especially after Citizens United) transcends parties. In this enterprise Trump is largely a front man for the real forces running things. For these people, with fortunes going back even into the nineteenth century, it’s natural to regard the country as a money-machine. Taxes, regulations, and government services—except for the military—are deductions off the bottom line. The problem with that view, even for them, is that it is the wrong model for the world we just described. That set of policies would make sense in an extractive economy, where all that is necessary for success is a cadre of imported experts to arrange for pumping oil with purchased technology. In that case you don’t need much from the national population in order to collect the proceeds. That’s not our situation. As described, we live in a technology-dominated world where the population must earn our national success. For that world we’re currently going in the wrong direction. Devaluing education, denying climate change, cutting research, encouraging xenophobia will get to us sooner than we’d like to think. China is a formidable challenger. However, it not so hard to be optimistic if we can just be serious about what needs to be done. We have all the tools for success: the money, the work to be done, even the means to avoid a two-tiered society. The story is not complicated. If we can return to exploiting our strengths, then we should be able to remain in the technological forefront for our chosen areas of focus. If we can control the monopolies, then the associated margins in an expanding world economy should yield money enough (if we can collect it) to produce a workable society for everyone ready to participate. There is certainly no shortage of work in the infrastructure area, and it needs all kinds of people. In this respect the Green New Deal may be too glib in pinning everything on climate change, but their basic idea is correct. If we play our cards right, the high technology future will provide the funds to support the infrastructure for its own success and for the prosperity of the nation. We should not underestimate the job. Careful and transparent planning is critical—defining exactly what needs to be done to support both the economy and the population. And then determining how that work can be best supplied. It should be emphasized is that we’re NOT talking about socializing away the free market economy. If there’s one bad misconception that needs to be hammered down everywhere, it’s the idea that the private sector is magic for all problems. We’ve just gone down a long list of things it’s not going to do. Even Adam Smith was clear about this from the beginning. The private sector is a participant in the public economy, but that economy will deliver the benefits of a free market only if #1 government keeps the private sector from corrupting the markets (e.g with monopolies and bribes) and #2 government provides the resources (e.g. education and other infrastructure) necessary for success. That’s the definition of our job. This will necessarily require a renewed focus on government and public service. It’s interesting that a couple of recent mainstream books (Volker, Lewis) have recognized public service as an important issue. In that respect “Green New Deal” isn’t a bad term: we need to be as serious as Roosevelt’s brain trust in planning for the next stage for our country’s future. This is a battle both old and new. In Smith’s words, “The interest of [businessmen] is always in some respects different from, and even opposite to, that of the public …The proposal of any new law or regulation of commerce which comes from this order, ought always to be listened to with great precaution, and ought never to be adopted till after having been long and carefully examined, not only with the most scrupulous, but with the most suspicious attention.” Wealth of Nations is only achieved when government does its job. You can’t turn around today without someone talking about how great the economy is. Low unemployment and low inflation. What could be better? We incurred $985 B of deficit this fiscal year as short-term stimulus to an economy already at full employment. That’s a monumental $300 B over last year—in good times. As in every other such case, the tax cuts are NOT paying for themselves. During the year we had a small reduction in unemployment from 4. 1% to 3.7%, but at no faster rate than last year and with no increase in inflation-adjusted wages (one-time bonuses from the tax cuts were negligible in the statistics). You might ask why we would do such a thing—$1 T is a lot of money—but one thing the deficit certainly delivers is that much more economic activity in an election year. The same people who starved recovery from the 2008 crisis to help with the 2016 election gave themselves a big boost for this one. We’re running up unimaginable deficits in good times, with consequences we’ll talk about in a minute. And the chart actually understates the situation. The underlying figures come from a CBO report written in April, when their estimate of the 2018 deficit was $805 B. With a final 2018 deficit of $985 B, the situation now looks considerably worse. The CBO report said that we would reach deficit = $1T by 2020 and then reach the sinister milestone of debt = total GDP by 2028. With the current deficit, we have reached the $1 T value in 1/3 the time, so that second milestone looms sooner now too. The stock market is a similar case. The corporate tax cuts went directly to company bottom lines, raising price/earning ratios and stock values. What’s more corporations turned around and used all that money for stock buybacks, increasing demand for stocks and further enhancing stock prices. None of this is sustainable. Much discussion of deficits seems theoretical, but the consequences of our current deficits are real. Republicans are already talking about cuts to Medicare and Social Security as counterpart to last year’s tax cuts. Just imagine now we’ve reached a downturn in the economy—not even necessarily as bad as 2008. We’ll have the massive deficit-induced debts shown in the prior chart, and now—on top of that—tax receipts that have just collapsed with the economy. In that case we’re not talking about changes around the edges of Medicare and Social Security, we’re talking about no money for it and “taking the hard choices we just have to do.” That means dramatic change in what it means to be living in this country. Further (as noted in the CBO report) the deficit is a time bomb. As interest rates rise in good times, the yearly cost of financing the deficit rises accordingly. We’re already talking about deficit finance costs higher than the defense budget. And it will just continue up, eating into available money for healthcare, education, opioid crisis even before a downturn. There are good reasons not to incur deficits in good times! With all Trump’s talk about the private sector and relief from regulation you might think that the country has been liberated from misguided government meddling with private enterprise. But you’d be wrong. The current executive-imposed tariffs and trade wars constitute the most extreme government intervention in the economy within memory. The steel tariffs hit anyone building anything out of steel—basically forcing export-directed activities off shore. The new USMCA regulations have already caused layoffs at Ford (and the touted benefits to labor are so far from clear that the unions can only wait and see). The trade war with China disrupts values chains of any corporations not sufficiently well-connected to get exemptions. The government is choosing winners and losers in the economy based on impulse (coal and steel sound good) or lobbying (the Apple watch). And established companies have been winning out over newer, innovative ones (net neutrality) any time the issue comes up. All of that, together with xenophobia and lack of support for education, augurs poorly for the state of our economy going forward. And we’re even waging economic war with the largest, most rapidly growing economy in the world—in the name of protectionism! Since the subject is the economy, we’re talking here about the related topics of personal and national economic success. It is of course a truism that the world economy is changing. Good jobs, and the jobs that maintain our national standard of living, are changing. Very many of them require more and different training. (One list of the top ten growing job categories is given here.) Economists going back to Adam Smith have recognized the responsibility of government to educate the population. However with the tax cuts we took a very different tack, essentially trusting private sector prosperity to raise all boats. There is no evidence that works. The tax cuts went primarily to stock buybacks (see the mind-boggling level of buybacks below), leaving issues such as education (including the student loans crisis), infrastructure, and healthcare up for grabs. For now, protectionism is the solution to job retraining, consequences of automation are unaddressed, and instead of preparing people for good jobs we’re busy fantasizing about the past. Climate change belongs on this list, because inaction will just make the economic effects worse. Climate change may have morphed into a partisan issue, but nature isn’t fooled. Consequences will be in many forms—severe weather, changes of temperature and rainfall, sea-level rise. Turning around today’s carbon-based economies takes time, so if we don’t start acting now, we’re talking many trillions of dollars of expenses for repair and to forestall truly disastrous consequences. The recent IPCC report found more serious effects than previously recognized by 2040. As the following chart shows, the US currently generates twice the per-capita CO2 of any other major player, so we have a long way to go. For now we are doing worse than nothing. Climate change is an issue where international unity of purpose is extremely important, because cheaters—with cheap coal—can prosper. We have not only endorsed coal for ourselves but actively encouraged cheating. Further our departure from the Paris Agreement process—and in particular our disavowal of the whole idea of rich countries helping poorer ones act in our common interest—leads directly to dangers such as Brazil abandoning protection for the Amazon. Ignoring climate change means more damaging effects of warming, and more drastic (and expensive) action in the end. Furthermore, as a purely economic issue, by denying the issue we are sidelining our own companies’ participation in this necessary multi-trillion-dollar enterprise. The day will soon come (we’re now talking just 20 years to get off coal, oil, and gas) when this moves to page 1 of the news, and stays there. Our never-never land economy is good only so long as we keep our eyes closed. But if we don’t open them soon, we won’t recognize what we’ll find later. A recent book serves as a reminder of what happened in the economic collapse of 2008. Lessons from 1929 were learned, and the world pulled itself back a few inches from the brink. Major economies, principally the US and China, pushed enough money into the world financial system to keep it going. We didn’t have a depression, and ten years later we’re doing well enough that we seem ready to forget. Who were our friends in 2008? The Chinese and the competent people who knew what they were doing. Who won out? Opportunists of various stripes who saw the near-depression as an opening. And their villains were the usual suspects: elites and foreigners. Elites and foreigners are always convenient scapegoats, but scapegoating these days seems to dominate all political discourse. That is a problem for both the left and the right. Let’s start with “elites”. When you come down to it, in both cases the elites are charged with the crime of turning the US into something that doesn’t look like a rose-colored picture of the 1950’s and 60’s, when America was “great.” It’s convenient to find someone to blame for those changes, but the world is not the same. You can argue about trade policy (and why it happened), but you can’t wave away the accelerating effects of technology and globalization (itself fueled by technology) with scapegoating. No nation today can isolate itself behind tariff walls or anything else and maintain its standard of living. We’ve done a bad job of solving problems of transition for the current real world, but trivializing those problems doesn’t help. In Trump’s case we have the craziness of reducing support for education and research while promoting coal mining instead. His trade wars are more a publicity stunt than a solution to the problems of the working class. With “foreigners” the problem is if anything worse. It is worth remembering our common interest with the Chinese in 2008. Despite the current trade war propaganda, China is neither friend nor enemy. China is a major partner in worldwide, technology-fueled growth that has made the world and us richer. They are a major player with a common interest in dealing with climate change. You can’t deny their effect on the domestic economy, but we also contributed to the pain. We have specific issues that need to be addressed—e.g. intellectual property, opening of markets in a now richer China—however the main challenge from the Chinese is that they are good at what they do. American high-tech companies have had trouble making headway in China largely because of real competition. As China grows, we need to remain at the top of our game and to adapt to a world where we are not the largest and richest market (already true). That could be quite a good future with new products and new markets, or we could all strangle in trade (and possibly real) wars. The divisions in this country are deep, but it is perhaps encouraging that it is less about issues than about scapegoats. If we could just remember that it is NOT all about ill-defined elites and foreigners, we could get quite a lot done. We are ten years into the current business cycle. We have not repealed the law of gravity. The cycle will end, and history says sooner than we would like to think. It’s important to recognize what that means. Very simply we have to be realistic about what we’ve put off for tomorrow. If we’re not serious about something today, there is a fair chance that tomorrow isn’t going to come any time soon. Education: Funding for education has never recovered from the 2008 crash. This affects all aspects (building, salaries, equipment) and all levels. It directly contributed to the student loan crisis. It affects the well-being of young people and our competitiveness as a nation. Infrastructure: Both candidates raised the issue in the election, but nothing serious has been done. Opioid crisis: This is a monumental problem that has thus far received only lip service. Wages: Businesses got a huge tax break with the Trump tax plan, but nothing has shown up in wages. We can’t even talk about raising the minimum wage from its historic (inflation-adjusted) lows. Medical coverage: ACA has been deliberately crippled with nothing coherent to replace it. Climate change: We can pay now or pay more later, but we won’t be able to run away from it. Thus far we’ve just closed our eyes, but the changes will be non-trivial. Carbon capture—the least drastic path in the most optimistic estimates—would be at least 5-10 Trillion dollars a year worldwide. In these good times we’ve chosen not to address any of those issues. Tax cuts for businesses (now turned into stock buybacks) took precedence. Unless something changes soon we should recognize that we have chosen to live with all of those problems—for as long as anyone can see. On the occasion of Apple’s rise to become the first $ 1 T company, the NY Times had a good article with graphic displays showing the size of Apple (as well as Google, Microsoft, Amazon, and many others) in the US economy. There are a number of lessons to be drawn from this. 1. The surprisingly dominant role of Apple—together with the other three just mentioned—shows the importance to this country of technology leadership. That’s what supports our standard of living and always has. Railroads, steel, automobiles were all high-tech in their day. We cannot pretend that even behind high tariff walls we can build a successful economy out of staying put. Our challenge is to seize the opportunities and bring everyone along. One important positive from this story: much of what these companies sell didn’t exist twenty years ago, which says a lot about opportunities for the future. 2. It’s worth recognizing that (despite all the fuss) China’s rise has been a good thing for Apple and for the US economy generally. The iPhone is a prime example of why trade deficit arguments are wrong. One of the most profitable American products ever is a loser in the trade deficit, because profits are declared in Ireland for tax purposes! Are we really going to tell China: “Don’t send us any more of those cheap iPhones that we sell everywhere at 300% markup until you can buy more yourselves”? – A skilled workforce. Implies support for education. – Equality of opportunity, so that we can use all talents and ideas. Education is a big part of it, but healthcare and other contributors to family stability are important too. – To be the place where people with entrepreneurial ideas will want to come realize them. Google (with an immigrant founder) and Apple (Steve Jobs’ father was a Syrian immigrant) are convenient and far from exceptional cases. – Creating a global environment for trade and cooperation where we can be successful. That means international engagement on rules for all. 3. Apple is also emblematic of the high-ticket corporate welfare we are now practicing. It’s hard to argue that Apple, of all companies, needed a huge tax break on $252 B of repatriated profits plus a current-income tax break, all yielding $100 B of stock buybacks. US companies were doing fine before the new tax plan, and stock buybacks have been the primary result of their tax savings. In other words, companies have decided the best thing to do with their tax cut money was just to give it back—for the benefit of the rich people who own them. The other side of that policy is our current inequality of wealth and opportunity. We have refused to help our population move to the increasingly high-tech future—and created a cast of bogey men to blame for it. We won’t spend money on education, infrastructure, or people—despite the difficulties of transition. We’ve fought unions and anything that gives workers clout. But it’s the Chinese, or the Europeans, or the liberals, or the immigrants who are to blame. We’re moving toward a worst of possible worlds: a capitalist mal-distribution of wealth combined with socialist top-down economic policy. We’re fighting tariff wars so senseless that even the Kochs are complaining, because Trump feels empowered to decide which sectors of the economy ought to be winners. Apple’s success shows what happens when we build to our strengths. We know how to do that. We did it for a long while. But for now we’d rather shut our eyes to the opportunities, and pretend we can bring back the good old 1950’s. It tells a lot about our current economic policy to compare it with China’s own plan for their economy. They want to move up the value chain—to be Apple with the big profits instead of a hardware supplier in a highly-competitive business. They want to do that across the board in all technologies. They aren’t afraid of automation’s impacts; they want to push it as hard as they can. Having transitioned their economy to free market concepts, they are ready to transition their workforce to what it takes to win. They want to be us! Except that we don’t want to be us anymore. We don’t like Apple, Google, Facebook, etc. because those companies don’t hire very many people without technical skills. We need to set tariffs to bring back the 1950’s, so that those people can have jobs. And our country is a disaster area until we do that. So we need trade wars to be great again. There are a number of problems with that logic. – To be the place where people with entrepreneurial ideas will want to come realize them. Google (with an immigrant founder) and Apple (Steve Jobs’ father was a Syrian immigrant) are convenient examples. – Creating a global environment for trade and cooperation where we can be successful. That means international engagement. If we want to maintain our standard of living, these items are primary and we should be doing everything necessary to be successful. There is not necessarily just one winner, but you have to be playing the right game. 2.The well-being of the population requires separate attention. The problems today are not because business is hurting. It isn’t. The population is not prospering as it should from our financial success, because we (through our government) have chosen NOT to make it happen. We have blocked investment in the population and the public good, and just given more and more of the created wealth to the wealthy. That’s why we can’t fund education or infrastructure. The new tax plan is a recent and extreme example. It says a lot about the political climate that Trump can make a statement like “cash-strapped cities cannot hire enough police officers or fix vile infrastructure” (in rejecting the Paris Climate agreement) and get away with it. The statement is true, because he and others like him have made it that way. 3.Tariffs are not a miracle solution; they are a tax. Tariffs are designed to raise the price of the products sold internally, so as to protect domestic businesses. That means that non-competitive businesses are supported at the expense of others (businesses or individuals) that use those products (e.g. steel). The markup is effectively a tax. You can do some of that, but just as with any other tax you have to look at who gets hurt (e.g. anyone who builds with steel or buys steel products). The effect is not all that different from using taxes to support public works. But with public works projects you at least know what you get. Rather than subsidizing companies and hoping for the best, they pay people for necessary work that the private sector won’t do. Education and infrastructure are only under-funded because we choose it that way. It should be noted that protected companies have little incentive to make themselves more competitive on an international scale, so the tax is usually forever. Also companies that need tariffs to compete are by definition highly cost-sensitive, so wages need to be tightly controlled. Tariffs—like other presents to businesses—are a way of dealing with exceptional or temporary issues (e.g. real national security or bankruptcy), and they certainly don’t help with automation. They are not a miracle tool for recreating the 1950’s. 4.Isolating ourselves behind trade barriers is conceding the game to China. Compared to Europe, the US had a much bigger domestic market than any other player, and that helped the US to evolve for financial success. China already has a bigger domestic economy than we do, and they’ve just gotten started. They’re putting money into infrastructure and education. Their AI systems have bigger databases to learn from. They’ve taken over our leading role for technologies of climate change. With trade barriers, and xenophobia, and intellectual property paranoia we risk losing our edge. China’s industrial espionage is a problem that requires continuing attention, but the effects of our new isolation policies may make matters worse. 1. We need to open the Chinese market. China is now rich enough to be significant as a market. One way to think of the opportunity is the enormous recent increase in the number of Chinese now traveling abroad. Those people are our potential market and even the Chinese government has to listen to them. Further, the US plus Europe represents 36% (18 + 18) of the Chinese output. With that kind of leverage we don’t need a trade war (as emphasized by the Business Roundtable of corporate CEO’s), we just need to use it for the situation we’re in. Instead we are stuck with two trade wars, because in Trump’s world we’re fixated on being the only winner—a good way to make sure that everyone loses. 2. We need to do everything possible (including all points noted earlier) to support the economic strength of the country in the current technological world—as opposed to the world of the 1950’s. 3. We need to go back to translating economic success into well-being of the population. It is to our benefit to get everyone on-board with what it takes to be successful. Furthermore, we need to remember that there is an important place in the economy for public works—and not just roads and bridges. There’s no shortage of work that needs to be done, and we just gave companies $1.4 T to not do it. Even Adam Smith knew that not every job that needs doing will be magically performed by the private sector. It’s a simple as that. Most wars are fought out of stupidity. Including trade wars.